More from H&M. 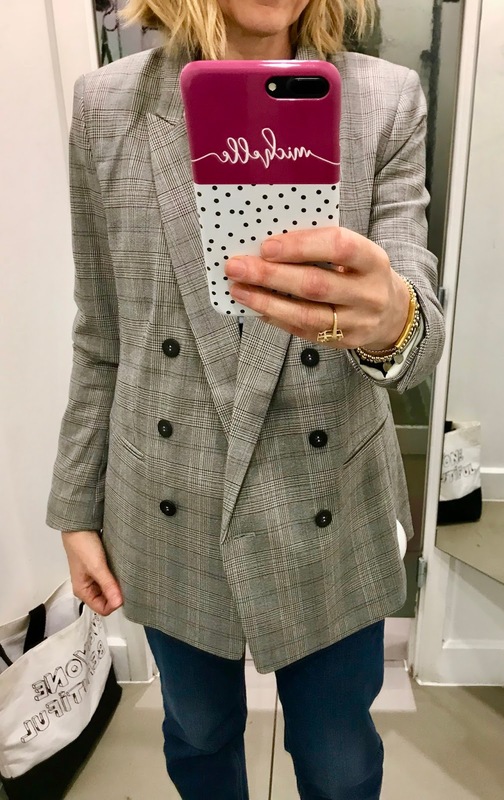 And another item finding it's way into my wardrobe thanks to another fab Insta buddy @teeclutter who popped this on her blog recently. 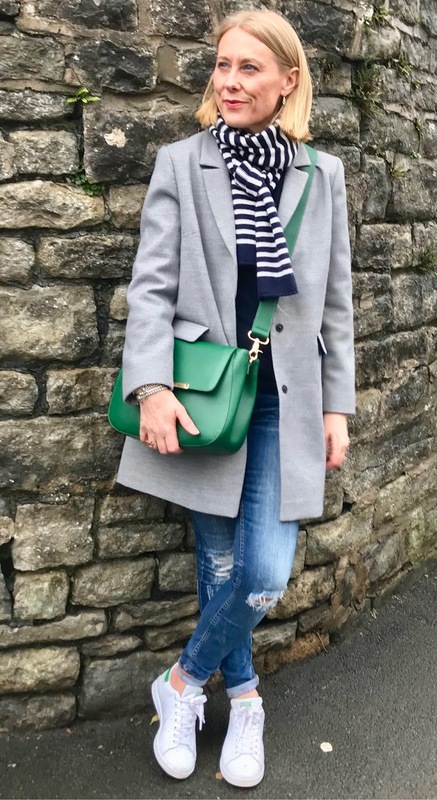 My love for all things matching knows no bounds.....Sienna Jones green bag, Stan's and a pre-loved green velvet jacket mean the tee is a winner! 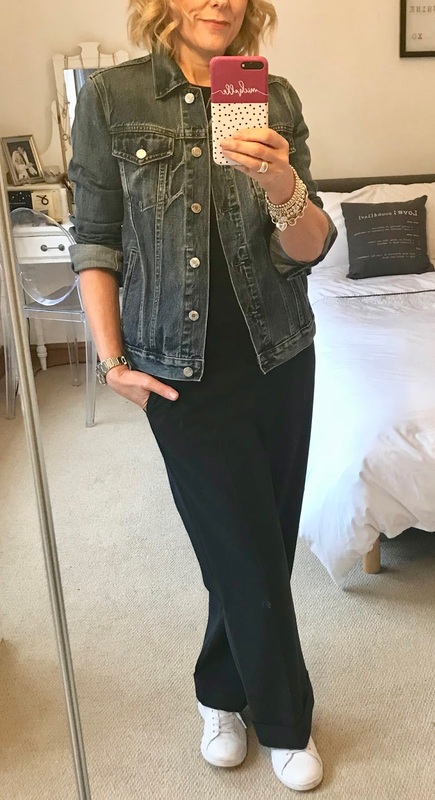 I popped in the leather look wide trews (above picture) to make the order up for free delivery and 10% off (since I'm in H&M most days to do my #michelfie doing returns is a good excuse to go in!). Anyway I love them so they are keepers as they are a great alternative to jeans. 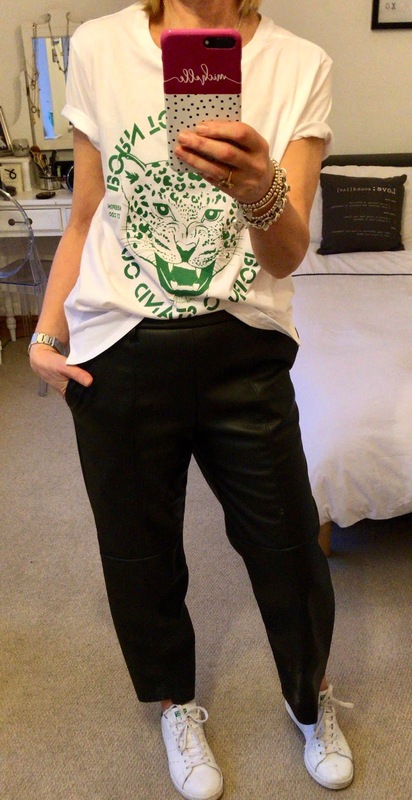 My lovely local friend @karenlowe15 has styled them to perfection so do check out her account! I think that's plenty enough damage in H&M for one week. Next up.....I got to choose a couple of items from Pure Collection from their *new in* pieces. 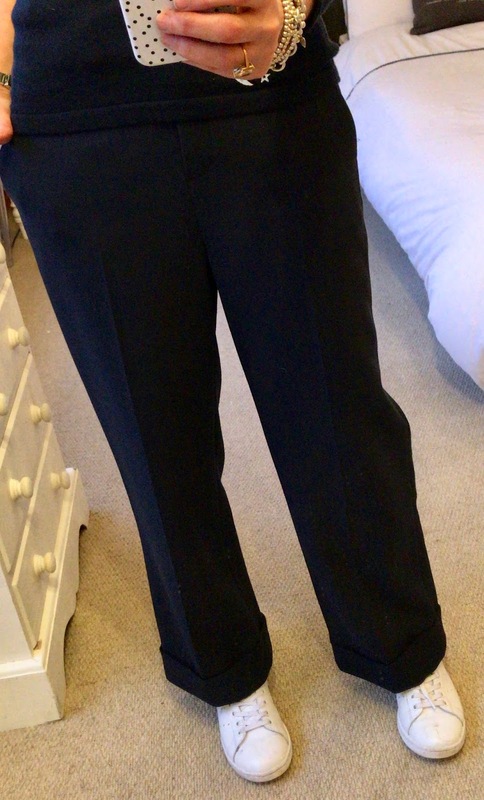 I'm in a bid to get some more navy into my wardrobe. Can't beat a classic crew neck sweater. Generally I size up and go slouchy but now that I have some higher waisted straight jeans I want sweaters I can tuck. 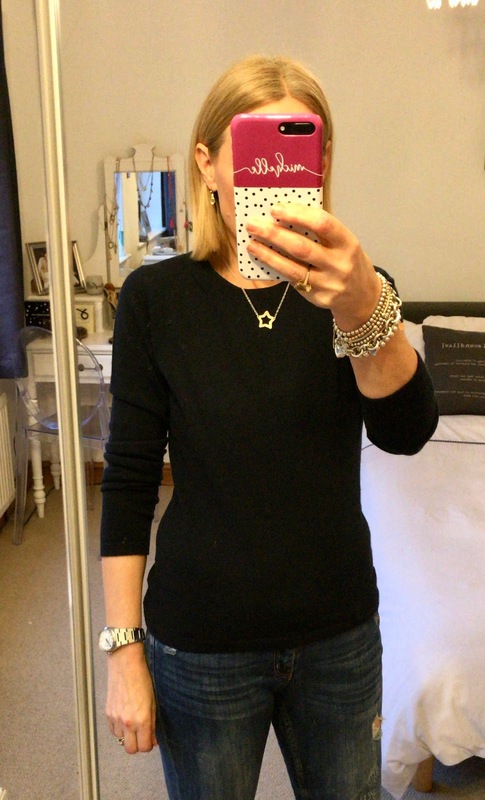 I love the slim fit of this jumper, perfect for layering. It's beautiful quality cashmere too....absolutely worth the investment. I have a code too! 20% off using FASHION40 as well as free delivery and returns! The 2nd piece I chose is another piece in a bid to break the jeans habit. A skirt!! This was love at first sight on the website as my immediate thought was style with white trainers. Now praying for some mild, leg-baring weather because I can't wait to wear this! Sticking with the navy theme. Yet more jeans alternatives. I adore these. I'm not 100% that they are keepers as they may be just a little too smart for my lifestyle. However, they hang beautifully, the fabric is quite heavy and they fit beautifully. Talk me into them ladies!! Another jacket added to my collection. Whilst putting in some research for my Top 5 Spring coats/jackets post I was checking out Gap when I saw this. Admittedly I have 2 denim jackets already but there was definitely a hole in my wardrobe for a mid-blue one. And as it had 30% off that day instore I thought it would be rude not to indulge myself. Great for layering under coats until warmer temps arrive! Finally.....an accessory guaranteed to elevate many an outfit. Well it is striped! 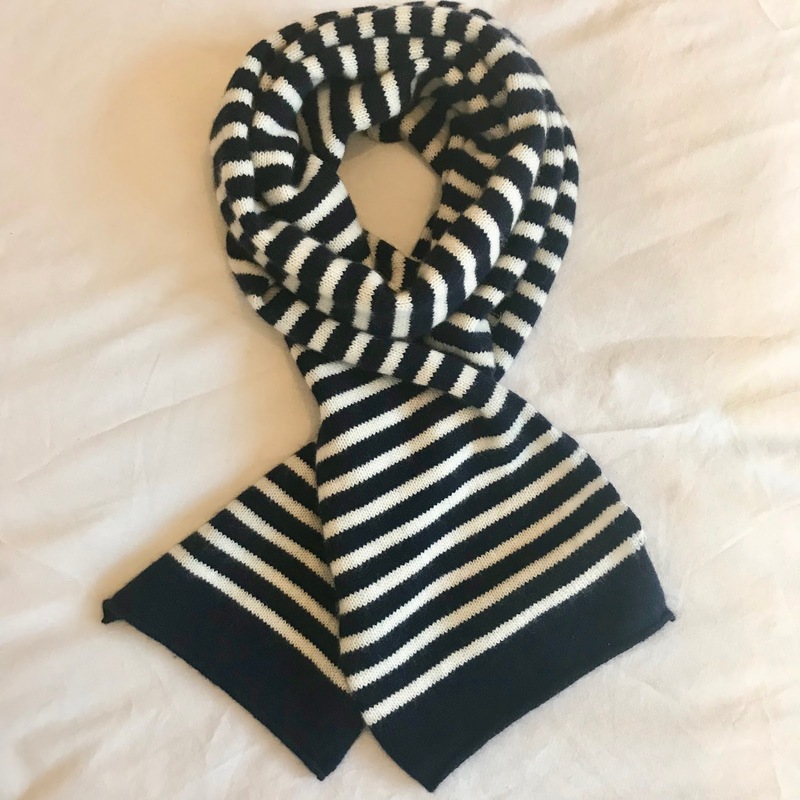 This was a gift from SomerilleScarves and it's very well reduced at the moment. I have the navy and white and I've worn it non-stop since it arrived. Now I can't promise a no spend week this week. I'll be doing a bit of shopping in London on Wednesday. There may be nothing more exciting than a couple of Uniqlo heat-tech purchases for an up and coming trip to New York in half term when the weather forecast is currently advising it'll be -2 degrees. Yikes! But there again, with 20% off at Warehouse (until Wednesday 31st) this shopping malarky could go even more Pete Tong! My picks are over in the side bar -> -> -> if you want to a take a peek. 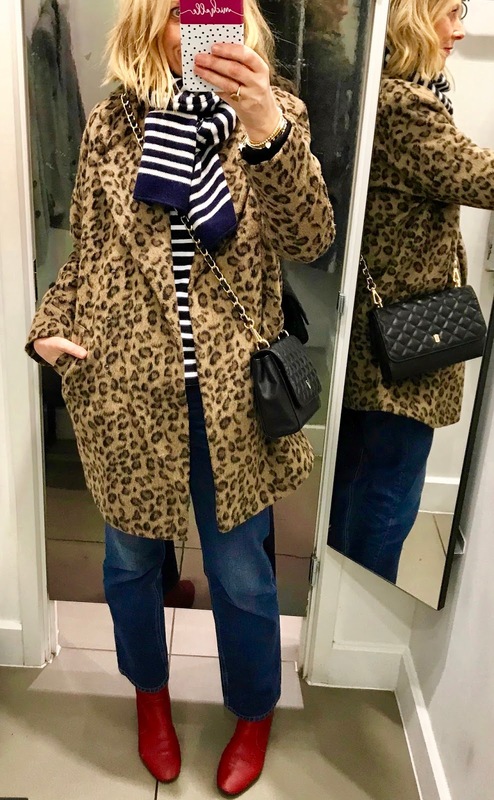 Recent outfit round-up......you can see the new scarf in action! I shall be back on Tuesday with my Top 5 coats/jackets to see me through Spring!